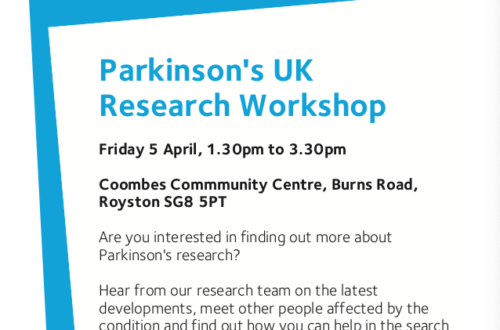 John, with Parkinson’s, and Sue have been involved with the RSN since its inception and Public and Patient Involvement with the NIHR for a good many years. However, their role as VRC has really been what they choose to make it within the bounds of Parkinson’s UK. When we moved to Cornwall nine years ago we struggled to find information on local research. Nobody really knew what was going on in the area. We met an excellent Consultant who spoke about research and asked if we were interested. We jumped at the chance. Through that consultant we were able to fill in the usual paper scales to track different symptoms and became aware of the Brain Bank. But nobody with other consultants in Cornwall seemed to know what was going on. In our role and through the RSN, we keep up to date about trials and research. We are lucky to have a consultant who is closely involved with research at Plymouth University and we have been able to use her links to get a good idea of what is coming up in the pipeline. We write articles for the local Branches’ Newsletters and speak at Branch and support group Meetings. We have organised focus groups for researchers to meet pwP to discuss the significance and feasibility of proposed research projects in an informal setting. We have extended our role significantly in that we have worked with people in the Clinical Research Network to stage two regional conferences in the South West, one in Plymouth and the other at Buckfast. The intention of these was to reach as many people affected by Parkinson’s as possible, introducing them to the teams involved in each clinical trial and helping them to feel that participating was not beyond them. In addition we invited leading researchers whose research had recruited heavily in the region to come and tell us about the results. What would you need to get started? You would find it useful to have an introduction to all the local support groups from your Local Volunteer Coordinator. Links to the editors of the local branch newsletter.